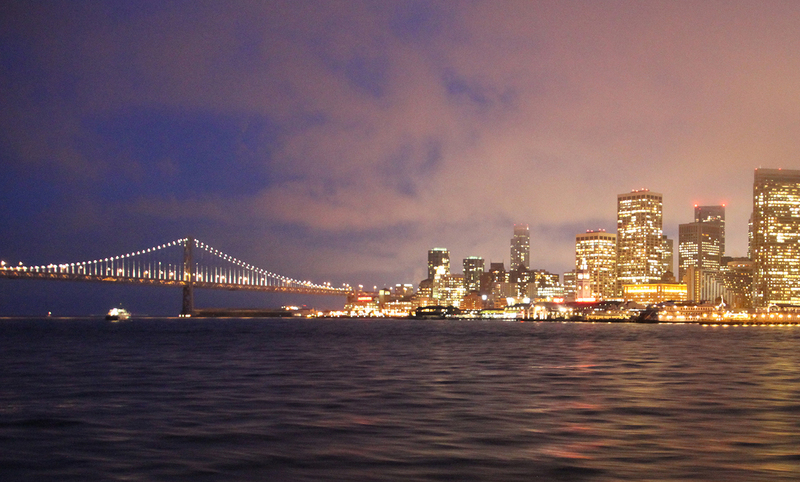 See San Francisco’s sparkling city lights from the Bay! Note: the California Twilight Cruise® operates during our Winter season from November 3th, 2019 through March 22, 2022*. During the winter months, Red and White Fleet offers visitors and locals alike the opportunity to see San Francisco’s skyline and the Bay Lights shimmer in the evening, while appetizers, live guitar music and drinks are served onboard. It’s the perfect way for couples, friends and families to enjoy the sights and sounds of one of the most talked-about cities in the world. Cruise along the illuminated skyline of San Francisco with its modern skyscrapers and historic landmarks, past the infamous island of Alcatraz, under the impressive. San Francisco Bay Bridge and the legendary Golden Gate, while sharing drinks with friends and family. Many of San Francisco’s famous structures and landmarks have special holiday lights from November to January making the views even more spectacular. Some sights on our twilight cruises include the San Francisco Ferry Building, Coit Tower, Treasure & Yerba Buena Islands, and AT&T Park. You’ll instantly understand why so many people throughout the years have made San Francisco their home. If you’re visiting from out of town, you may just want to stay an extra night or two for added opportunities to sightsee! You will be amazed by San Francisco’s sparkling city lights, as you enjoy an assortment of tasty appetizers. San Francisco becomes quite chilly during this time so nestle up in the warm and cozy atmosphere of your Red and White cruise boat where you can enjoy hot drinks from the bar. San Francisco’s illuminated skyline and holiday lights will be sure to dazzle you while you delight in live guitar music onboard. If you’re planning to stand on the deck for any length of time, we highly recommended you bring a jacket or blanket to stay comfortable despite the breeze. Be sure to bring along your camera to capture the moments made during your California Twilight Cruise. That way, you can share your discoveries with friends and family. Don’t forget that the Red and White Fleet is online at Facebook, Pinterest, Instagram and Twitter. We’d love to see your images from your sailing adventure, so be sure to tag us when you post any pictures from your trip. Circle around Alcatraz at twilight Advance bookings are highly recommended to ensure you get the California Twilight Cruise you want. These can be made online or by calling our offices. All of our vessels feature roomy indoor spaces with large windows and upholstered seating. One beer, wine or soda is included with the cruise. Additional drinks are available from the bar. Additionally, all twilight boat tour tickets are valid only for date booked. Sorry, neither smoking nor outside alcoholic beverages are permitted on the Red and White Fleet. Come sail with us the next time you’re in the mood for adventure. Whether you’re a resident of the San Francisco area, or you’re just stopping by, we’d love to show you the best the bay has to offer! Children ages 4 and under receive complimentary admission to Red and White Fleet cruises but need to be ticketed for capacity control. If you have a child aged 4 or younger inform our staff in the boarding line and we will give you their complimentary boarding pass.